Orlando Cruz has won his first fight since publicly declaring he is gay. The Puerto Rican boxer beat Jorge Pazos to retain his light featherweight title in a unanimous decision. The judges scored Cruz 118-110, 116-111, 118-110 , who celebrated the victory in front of a cheering crowd at the Kissimmee Civic Center outside of Orlando. "That was my moment, my opportunity, my event," Cruz said Friday night after the bout, his mother, Dominga Torres-Rivera, seated beside him. "And I won." Cruz was touched by the support on display at the Kissimmee Civic Center outside Orlando, the latest in a continual outpouring since his announcement two weeks ago that made him the first active male athlete in a major sport to come out. "I was very happy that they respect me. That's what I want -- them to see me as a boxer, as an athlete and as a man in every sense of the word," he said. 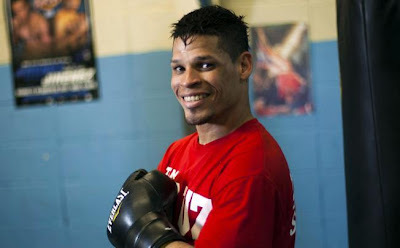 Cruz's declaration has garnered plenty of attention and interview requests for the WBO's fourth-ranked featherweight, as well as public support from everyone from former Olympic teammate Miguel Cotto to singer Ricky Martin. "With all that's been going through my life the past two weeks, I have no excuses," Cruz said. "It did affect me, going here, going there. It did affect me." But Cruz (19-2-1, nine KOs) looked comfortable once he stepped into the ring, quickly negating Pazos' longer reach with his own fleet feet. As a result, Pazos (20-4, 13 KOs) spent most of the night lunging after the smiling Cruz. Pazos threw more punches, but Cruz made his count. Although the Mexican Pazos held his own for much of the fight, it was Cruz standing on the ropes playing to the adoring crowd moments later with a 118-110, 116-111, 118-110 decision. "He's a boxer who moves too much, he knows how to box and he has good legs," Pazos said. "I couldn't get him." "This fight's going to open my door for a world title fight," Cruz said. "That's my dream, my mom's dream, my community's dream and my team's." And Cruz seems to be more at ease with his new position as a gay role model, no longer hiding who he is in one of the world's most macho sports. "I'm only one person," Cruz said. "I feel happy with where I am. I'm free. I'm more at peace."